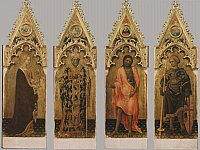 Rooms 5 and 6 show works by different painters, not only coming from Tuscany, whose style can be defined as International Gothic. 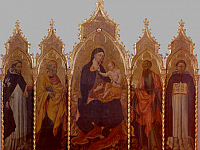 The period when these artists worked can be placed between the end of 14th-beginning of 15th century. 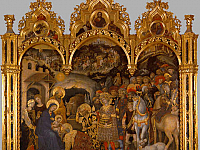 A magnificent example of this style is the Adoration of the Magi by Gentile da Fabriano, an artist coming from the Italian Region called Marche. 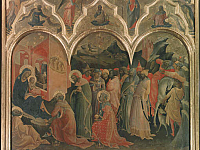 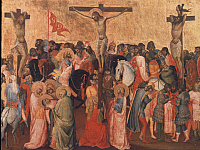 Gentile travelled a lot during his life and, once in Firenze, Palla Strozzi, a rich Florentine banker, asked him to paint The Adoration of the Magi for his private chapel in the Church of Santa Trinita. 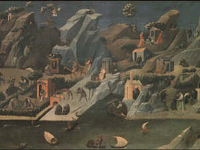 In this marvellous painting we can perceive the typical atmosphere of the International Gothic: the large use of gold and the fairy-tale like setting of the episode from the Bible. 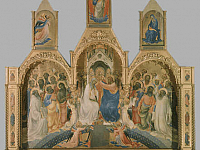 Another superb painting to be seen in these rooms is the Coronation of the Virgin by Lorenzo Monaco, another outstanding example of the courtly elegance of this period.